Help! Well, folks, I got an update on the auto situation. The mechanic stopped by today while I was gone (he’s a mobile mechanic, so you don’t have to be there) and his initial quote was $300. Ouch. He was thinking that the battery cables would need to be changed out, and those are dealership-only parts, so they’re quite expensive. But, he did a bit of work and figured that he could actually just repair what was there, so that repair will be a bit less costly. But wait, there’s more — in the process of removing the various and sundry parts, he discovered that the air intake hose had been corroded through; I had a check engine light come on recently, and this was the cause. Now this part is dealership-only for sure, and so my original quote is probably right back to where we began. He’s got to order the parts and will be coming by tomorrow to finish up the job and I guess I’ll know the final damage tomorrow. He is a good mechanic, though; in fact, he’s the same guy we hired to check out and certify the car before we bought it from a third party a few years ago. So… if any of you, dear readers, wish to chip in to Rodion’s Auto Repair Fund please, please do so… donations from 5 cents to $500 are welcome. There’s a widget at the bottom of this page on which you can set any donation amount. Or, you can just click here. My bank account has been hemmoraging funds as of late, and it will thank you, yes it will. Today was a long day — a very long day. I hardly slept at all last night: I was in bed around 11:00, and woke up around 1:30 a.m. and did not really get back to sleep after that. I guess I blame it in part on the full moon, but here’s the thing: whenever I have this kind of sleepless night, it seems that it invariably ties in to something odd that is going on with my wife. The first time this happened to me was the night that she consummated her affair. It was almost as if there was this palpable energy that was present, even though she wasn’t physically there. I don’t know if this means anything about her situation right now, but I wouldn’t be surprised to learn that it does. I have not heard a peep from her in several days, and even then it was just an email. In that email, she claimed she’d be out of town, but I have not seen any evidence of that. There’s not much to go on, anyway, as she is not updating any of her websites, so I guess that makes me even a bit more curious. Thus it was that I awoke just shy of 5:00 a.m. Since my car is out of commission, I had to take the bus into work. On a good day, this would take about 75 minutes; since today is Sunday, it took two hours. I started by walking a mile in the pre-dawn chill to the transit center. I did have the beautiful, full moon to accompany me, though. I thought I might find a cup of coffee, but everything was closed. So I waited for the bus, and when it did arrive it took forever to depart. Its tracking and payment device was non-functional, and it took the driver about 10 minutes to get it rectified. There were many unhappy riders in that bus. Somehow, I planned the itinerary with enough wiggle room that I made my next connection, and that one got me almost all of the way to my final destination. I ended up walking the mile or so to work, because by this time it was a beautiful, crisp morning. I had the time, and was able to stop off for a coffee along the way. I got home absolutely exhausted. I can barely see straight as I type this, but then again I’m actually at the point of feeling too tired to sleep, if you know what I mean. I guess that means I’ll do a couple of self-hypnosis sessions before hitting the sack. They do have the ancillary effect of helping me to sleep. The tracks I’m working with right now are Be Lucky and Stop Being Messy (yup, Messy Marvin, here). Neatness is definitely one of my fixings, and I have to say that this download has really helped a lot. I’ve only used it for about 4 days or so, but it already is having a noticeable effect. As for Be Lucky, well, the jury is still out on that one, but when all those donations to Rodion’s Auto Repair Fund (heheh… plug #3; annoyed yet?) start rolling in, I think I’ll know that one is working, too. Actually, I have had some measurable increases in luck since I started working with that one about a week ago. Actually, I’m curious what kind of results and successes readers of this blog might be having with any of these self-hypnosis downloads, if by chance you’ve checked it out and gotten any. I’m hoping some of you have in fact checked it out, and remember that there are free resources there as well, in case you’re leery about plonking down $12 to try out one of their sessions. Like I said, I’ve seen noticeable changes after just a few days with these tracks, so I’m wondering what others have experienced. Please feel free to leave a comment below with your experiences, or just go ahead and email me and we can dialogue that way, if you’d like. Really, I’m quite curious. I think it’s really powerful stuff, and I am very enthusiastic about it. Honestly, I wish I’d found out about them a whole lot sooner. Can hypnosis help you to save your marriage? Absolutely. But first, let me clarify. I’m not talking about hypnotizing your spouse or anything like that. Instead, I’m talking about using the power of self-hypnosis to disrupt unproductive behaviors that are affecting your marriage and to modify these into positive, productive behaviors. My own background with self-hypnosis goes back about 17 years to a time when I was in graduate school. I was dealing with a difficult academic situation (adversarial problems with my thesis advisor) and emotional issues in my personal life (a relationship that was not working out). I came across a book called Centering, by Jerry Kushel, which is long since out of print, and in it Dr. Kushel explained the use of self-hypnosis to modify behaviors and emotional patterns. I needed to get over considerable worry and stress, and recorded some sessions into my little hand-held tape recorder, which I’d then listen to. It did bring measurable relief, but I was a rank amateur. Click here for more information on self-hypnosis. Fast forward about a decade, and I had begun a relationship with my wife. We weren’t yet married, but had some issues to work through individually. She was having sessions with a hypnotherapist who also was a practitioner of emotional freedom techniques, and was having some significant breakthroughs. I had a session or two and found it quite transformative as well. After that time, my contact with self-hypnosis was kind of hit or miss; I’d use it sometimes to help myself fall asleep, but really didn’t have any coherent engagement with the technique. That is, until recently. It took a marriage crisis — and many months of it — for me to look for some resources on hypnosis. To my surprise, there wasn’t all that much out there, and there was pretty much nothing that was based here in the U.S., aside from a few questionable sites with squeeze pages that would result in endless emails pinging you with their terribly overpriced services. In fact, it was largely because of one such website that I began looking for more reputable and affordable alternatives. This is when I found HypnosisDownloads.com. I’m not here to push their services, not fundamentally. This is a personal blog about my experiences in attempting to reconcile my marriage. However, I have found the services that this website offers to be of the absolute highest quality, very powerful, and extremely helpful. And it’s inexpensive: the average download costs about $12, and you can use it again and again. In fact, the more you listen, the deeper the effect. Their main download page lists all of their available downloads, and there’s one for just about everything: not just marital issues, but also help with smoking, alcohol and other addictions, diet, exercise, anxiety, and much more. There’s also a free course in learning self-hypnosis that is excellent, and contains hypnotic inductions you can use on a daily basis. Learn Self Hypnosis. This comes with the free self-hypnosis audio course; you do need to register with your email for this track, but I have had zero issues with spam after having registered. Seize the Day. This one is great for ending procrastination and training yourself to take initiative, both of which are qualities that will help your marriage reconciliation. This was an audio that they were giving away for free for those liking their Facebook page, but this offer may or may not still be available when you click through via Facebook. Stop Being Messy. I admit it, I’m not a neat freak, and it was my laziness in keeping tidy that actually launched my marital crisis. I’ve only been using this track for a few days and it’s already having an effect. Automatic Writing. This concept might seem a bit odd, although I suspect it will be familiar to creative individuals: you can train yourself to write “automatically” while in a state of deep hypnotic absorption. I have found this skill incredibly useful, in that it helps me gain insight into situations that otherwise would have gone undetected. This was one of the first downloads I purchased, actually, and I use it daily. It has really helped me to understand where my wife is at, and has helped me to chart out a course of appropriate actions to keep me on track. There are plenty of other tracks that might suit your situation. Most of these titles run about $12, but there are some mulit-download packs that cost a bit more. Many of the tracks have suggested “bundles,” that pair the track with another complementary title that is given at a discount. If you find their services helpful — which I’m pretty sure you will — you might want to join their “Growth Zone,” which runs about $18 per month and grants you 2 monthly downloads of your choice, plus two randomly chosen hypnosis scripts (which you’d have to record yourself, but you could do this if you’d taken the free audio course) per month. You also get discounts on buying additional titles. It’s quite a bargain, really. So, can hypnosis help you to save your marriage? Again, I’d say, “absolutely.” Check it out, you won’t be sorry. I know I sure don’t regret it. Click here to visit the HypnosisDownloads.com official website. First of all, my heartfelt thanks to those of you who donated money to support this blog; there was definitely a noticeable bounce after my last post. Your generosity sure comes in handy right about now. Don’t worry, I shall explain. Today was truly a bad karma day, a comedy of errors, really. Since my car’s battery was basically kaputt, I called around to see if I could get it replaced somewhere, and found a pretty good solution — even had a coupon for it. So, I went outside and fired up my boss’s portable jump-starter. It didn’t work. The engine cranked a bit, but it just wouldn’t turn over. I recharged it a couple of times, and it simply wouldn’t work. The terminal connectors on the battery were pretty corroded, and the positive terminal was basically shot. I decided my best bet would be to bring a battery home, along with a couple of cables, and do the job myself. It just didn’t seem worth getting a tow truck out here for a battery replacement. I took the bus to the auto parts store, got the battery and other sundries, and headed back. I had to make a transfer on the way back, and the second bus driver told me that I couldn’t bring a battery on board the bus. This was odd, as the first bus driver didn’t even care. This meant I had to walk the remaining mile or so back home, carrying this incredibly heavy car battery. But the adventure had only begun. I popped the hood when I got home and got to work. I quickly realized that I lacked the right tools, so I made a separate trip, this time by foot, to the local home-improvement store. We live in a part of town where things are not nearby, so it was 15 minutes there and 15 minutes back. I did manage to get the battery removed (and took some flesh of my knuckles in the process, of course) but soon realized that replacing the battery cables was just beyond my skill set. The positive cable was so corroded I couldn’t even figure out what I was working with, what was connected to what, and what I’d need to replace. I decided to call it quits and head into work. This was part two of that adventure. I had figured I could catch a bus that would set me up to get to work on time, but I ended up missing it by about 2 minutes. On top of that, I didn’t have the correct change, and had to stop at the bank to take care of that. By the time I’d settled all that, I watched two separate buses go by, neither of which I could have caught. I finally did board one that looked like it would get me to the transit center on time. This bus just happened to be driven by the same driver who told me I could not bring a battery on board. I think he recognized me, and I’m glad I didn’t curse him out the first time; this time I was well dressed, so he seemed a bit confused. This nearly did get me to the transit center on time, but my connecting bus was pulling away right as we pulled in. I should mention that it was early afternoon at this point and all that I’d eaten all day was a bowl of oatmeal. I had about 30 minutes to spare, so I headed to a nearby cafe to grab a quick bite. Service was slow, so I got out of there about 10 minutes before the next bus arrived. By this time, I realized I was going to be late for work, so I called ahead to let them know. (They took care of getting things started for me.) This bus got stuck in rush hour traffic — three times. I needed to make yet another transfer (yes, this is true) and it looked like I wouldn’t make it. Somehow, we got there with one minute to spare and I did make that transfer. I got on this third bus, and was hoping to get to work pretty quickly. No such luck. Three people in a row asked the bus driver if he went to such and such address, and the driver had to think about it, as though he didn’t even know where these streets were. This delayed our departure by about five minutes. Then, we hit every single red light on the way. So, I ended up arriving at work 20 minutes late. I was fit to be tied by all of this, of course. I was able to get a lift home with a colleague (yes, this is luck! ), but I still don’t have an operating vehicle. I am currently looking into getting a mobile mechanic out here to take care of the battery for me; they should be able to do it on short order, 15 minutes tops, I’d think. I didn’t have much time to contact the wife today, or anything like that. In fact, I spent quite a bit of my time feeling rather annoyed with her. Don’t fret it folks, this is normal, and it happens to the best of us. I went through all the stories about how upset I was with her for being so selfish and so forth. They’re just stories. At the end of the day, she’s still my wife, and I’m not about to do anything so foolish as to blow my top with her over something like this. I did email her in the morning to let her know that I had some important information to discuss with her. I had spoken with the graduate school at the university regarding some procedural issues with her dissertation, and wanted to fill her in on it. She emailed me this evening, somewhat tersely, to ask me what it was all about, and to say she’d be “out of town.” That is, at Camp You-Know-Where. My response was, “just call me please.” I do know that her dissertation advisor is on her case about finishing up. I suspect there will be some very real tension over this. So it was very frustrating, this day called Thursday, September 27. Heck, I’m already out over $100 on the battery and parts, and will be forking over some more to get it installed. By the way, I’m still open for blog donations, if any of you should feel so moved. Consider it a Rescuing Rodion’s Battery Drive, if you will. Old Rodion will be ever so grateful. Let’s make it a great Friday. Cheers! I got home this evening (I’ll get to that in a moment) and found my suspicions to be true. As I wrote in my last post, I suspected that my wife would just totally blow me off this week and not even bother to pick up her dog. I think she goes through phases in which she is resentful of me for whatever reason, and when she gets that way she just shuts her phone off and ignores me. This current phase has been going on for about a week, and is an extension fo the five-week, ignore-the-husband phase that started last month. And, as I wrote before, I think this has a lot to do with the affair itself becoming very instable and susceptible severe damage from the slightest, which in this case would be an itty-bitty phone call from yours truly. So, I arrived home and the dog was here. Remember, to my wife, her dog is her world. Her dog is her most prized possession. She cannot stand to be without the dog. Well, except for sometimes. She went an entire month without the dog, and so she’s going to go another week. I don’t really get it, except to think that the whole idea of sharing custody of a dog must be so contentious to the “other man” (i.e. the adulterer) that he has managed to convince her not to go there. Whatever. This will ultimately be a temporary situation. I really think the affair is on thin ice right now and that it won’t take very much to shatter it. Fortunately, I didn’t have a long bus ride home tonight. My boss lives a couple of miles from here and offered me a lift. I somehow thought he’d do that. He seems to respect me, and to enjoy the camaraderie. Not only did he offer me a lift, but he also offered me his portable jump-starter that he happened to have in the back of his car, fully charged and ready for deployment. I was beginning to think that I was having good luck, or something. Actually, I’ve got to say that it’s sort of been like a run of good luck these past couple of days. Last week, a colleague left a bunch of free-ride tickets for the bus system here; I don’t know where he got them, but I grabbed a few with an eye to giving them to my wife, since she rides the bus whenever she is in town. However, since I sensed that I would not be seeing her at all this week, and since the tickets will have expired by next week, they really came in handy when I suddenly had to hop on the bus. I only had a couple dollars in cash on hand, and that would not have been sufficient to get me there and back, and I wouldn’t be able to stop off at a bank along the way. So, I popped the tickets into my pocket and headed out the door. The bus was late, but my connecting bus was early, so I was able to hop right on. This got me to my next transfer point early enough to take an earlier bus, which got me to my next transfer point early enough to hop on another, earlier bus. (Yes, I had to make three transfers, that’s why it took an hour and a half.) The weather was nice, too, so I didn’t mind all the time outdoors waiting on those connections. It was sort of a domino-effect of early arrival, early departure. What’s with all the good luck, then? I don’t know, or maybe I do, sort of. I started doing some work with self-hypnosis about a month ago; it’s something I had had some experience with many years ago, and had had a session or two with a professional hypnotherapist at one point. As a regular meditator, the hypnotic state is very familiar, as it is not all that dissimilar from some forms of meditative absorption. I did a bit of research last month on self-hypnosis, just out of curiosity, really, and was surprised to find a dearth of stateside companies producing such materials. Basically, there weren’t any. All of the reputable companies I was finding were in the U.K. 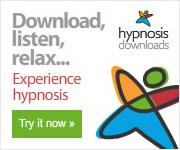 I found a company called HypnosisDownloads.com that is run by a staff of professional hypnotherapists. And when I say “professional,” I do mean Ph.Ds, not some random hucksters who claim to command hefty sums for their services. These guys know what they’re doing, and are not afraid to explain it. They even offer a free audio course through which you can learn self-hypnosis, and it’s a very good course, too: they explain the theories and concepts, the different techniques (confusional language, nominalizations, etc. ), how indirect hypnosis works, and so on. But I digress; what does this have to do with luck, anyway? Well, I had already bought a couple of their downloads (you can see the full list here) and had joined their so-called “Growth Zone,” which offers substantial discounts, when I decided, rather intuitively and somewhat on a lark, to try out one of their downloads on luck. It’s called “Be Lucky,” and builds on the work of Richard Wiseman, who studied the traits and habits of lucky individuals in a book called The Luck Factor, only to discover that luck appears to have more to do with behavioral choices and characteristics than chance. I’ve worked with this download a bit, and it does seem to have had an effect. I do think that self-hypnosis can be an invaluable resource for people who find themselves in marital crises. There are many negative thought and emotional patterns that can be diverted and redirected in positive ways via skillful self-hypnosis. I’ve also found that there are some skills that can be developed through hypnosis that provide real insight that have recently helped me to cut through some of the more confusing aspects of my reconciliation efforts. Best of all, it’s easy to do, and it’s not expensive either. I’ve put some links up on a separate page that you might find helpful. But this post isn’t a sales pitch. I only offer these ideas because I honestly have found them helpful — very helpful. No, this post is supposed to be a recap of the day, sort of the other bookend to which my last post makes a pair. It’s just gone midnight here, so I guess I’d better leave tomorrow’s post for, well, today. What, a new car battery? Read on, please. Today is Wednesday, and that means it is the day my wife normally comes into town. She’s in town even as I write this, and I can see the evidence in our online bank statement showing the purchases she has made. Normally, she’ll have her phone turned on when she comes into town, because she’ll want to coordinate a pick-up or drop-off of the dog. This is supposed to be her week to have the dog. Typically, I’d get a text in the morning to ask about this situation. Today? Nothing. Not a peep. I called her, and she has her cell phone switched off. I believe this is the Last Great Push before the final meltdown and her subsequent return home. Let me explain why. I have been looking on occasion at her blog and also at the adulterer’s professional Facebook, but not for information, at least not fundamentally. Information doesn’t really help me, because it doesn’t change what I’ve got to do. Instead, I’m looking at these pages as they sometimes give me an indication of where she’s at, mentally. As I noted before, her posting to these pages has become quite sporadic. I find this to be rather curious, especially because she’s not busy at all. What’s more curious, though, is the content of the last post that she made to her blog. Some time in the past few days, she met with an old friend who was visiting from out of town. She had not seen this friend for about 11 years. I remember her speaking with this friend a few years ago, in fact. This woman lives in California, and her husband was working in Silicon Valley. She had just had a baby, and a few months later discovered that her husband, who had been putting in long hours at work, was having an affair with a co-worker. Her reaction was typical: confront the spouse, give ultimatums, and then file for divorce. So now, a few years later, here that friend is in a picture with my wife. My wife describes her as her “best friend.” This in itself is curious: I had always been her best friend, and once this crisis erupted I was replaced by a colleague who lives a couple of blocks away from us, a woman who gave my wife safe harbor and encouragement for the commission of adultery. Best-friend rankings notwithstanding, here is this woman, sitting outside a cafe with my wife, enjoying a snack and a cup of tea. This woman has now been divorced for about two years or so, and mind you she is the victim of adultery, yet she seems to be comfortable catching up my wife, who, by the way, is of course an adulteress. Does this make any sense? It doesn’t make any sense to me. There seems to be some odd sort of disconnect in my wife’s world. She has other people in her circle of acquaintances who have been victims of adultery yet who still relate to her, listen to her trials and tribulations, give her encouragement, and so on. I find this very bizarre. What’s also rather bizarre is that, in this picture, my wife is wearing a pair of boots I bought for her birthday last year. The weather has started to cool down here with the onset of autumn, so I guess she can wear those again. She does love those boots. So now we have this most recent blog post, and on top of that a return to the let’s-ignore-the-spouse mode. Here’s my take on this turn of events. I believe that my wife’s situation has become very unstable in the recent weeks. I have seen her precisely twice since the 5-week period of silence that started in August. Now she seems to be returning to those tactics again. I do believe that, when I get home tonight (I’m at work as I type this; read on, please), I’ll find the dog still at home. There is something about being with me that is just too destabilizing for her right now. My sense is that the affair is in trouble. It’s been almost eleven months now, and so it’s probably pumpkin time for that relationship. I think there probably have been arguments and disagreements, and that the veneer has worn off that relationship such that it now looks like the fraudulent sham (is that redundant?) that it is. At the same time, I think she feels trapped: she appears to have moved some or possibly all of her stuff into his house, and she also seems to have bought an old junker of a piano that resides in his living room. (This is evident from other photos on her blog.) She probably does not know how she can extricate herself from that situation. Not only that, I imagine that her move-out from our marital home — an act which I’m all but certain the adulterer pressured her into — was a traumatic event for her; she almost certainly repressed that trauma, but it seems to me that the idea of moving out of the adulterer’s house will be yet another trauma she’ll have to inflict on herself. All of this would go quite a long way to explain my last encounter with her: as I reflect back upon that encounter, I just recall this overall sense of sadness about her, and a rather general, vague kind of depression. Things really are not okay in her world, that much is obvious. I don’t think she’ll voluntarily exit that relationship, though. She is very strong-willed and is capable of walking away from it, but I don’t think her will is that strong. I think it will take a major event to end it: a huge fight, or something similar, and the adulterer will probably have to insist that she leave. This makes the blog and Facebook posts even more interesting: they have a certain carefree, nothing-could-be-better aspect to them that is clearly superficial. It is as if she needs to create these posts to convince herself that her life up there at Camp C-S is really carefree, happy, and perfect. It’s just getting easier and easier to see right through these artifices. It’s as if she has two faces: one that she presents to the world, and another that she shows me, and these two simply cannot be reconciled. This is why she shuts me out. She simply cannot maintain that external face to the world when I can see into her heart and divine her true feelings. That would just be too dangerously destabilizing for her story. So, I think she will not come by the house to pick up the dog today. She has not contacted me at all, and I think the adulterer feels very uncomfortable being around our house in any event. I don’t think he’ll voluntarily go there. Not only that, I think that any request for him to do so would likely add more tension to that already fragile, failing relationship. Clearly they can’t have that now, could they? Nevertheless, I did put out the dog’s carrier bag before I left, and secreted a few little gifts in it. Then I walked out the door and got into the car. I put the key in the ignition, and the engine wouldn’t crank. Hmmmmm… I had noticed it cranking a bit more slowly over the past few days, as the weather had gotten colder at night. I think the battery had been getting weak, without really much advance warning, and seems to have mostly discharged overnight. So, I took the bus to work. It’s a 20-minute drive, but a 90-minute bus ride that involves 3 transfers. Yikes. What does this all mean, dear reader? Well, I think I’m in the final phase in which the affair winds down and comes unglued. I don’t have nay personal experience of this, of course, but it just seems really that she is getting ready to exit that whole process once and for all. It could literally be days, if not hours at this point. I just don’t think this has the potential to keep going much longer. It also means that I’m gonna need a new car battery tomorrow morning. If you’d like to do me a good turn, feel free to chip in via the “donate” button below. My car will thank you — and so will my wife: she’ll need me to get in that car and race out to rescue her from Camp Chickens**t pretty soon. Yes, once again, it’s another post about my wife going incommunicado. I’ve written at least a half dozen of these now. Each time, it seems, she goes silent or does something to attempt to cut off communication. This time isn’t really any different in that regard: her cell phone has been shut off since last Thursday, and she hasn’t responded to any form of communication at all. But this time is a bit different in one regard: anomalies abound. First of all, she has gone nearly silent on her blog postings and updates to the adulterer’s professional Facebook page. There really isn’t much content being shared on either venue at the moment, despite the fact that she pretty much has all the time in the world. In fact, she let her blog rest silent for three weeks, and when she did post, it was content that was at least two weeks old. This is very odd. Her very few Facebook posts have been both trivial and superficial; these seem to be vain attempts to preserve the veneer of the affair as nothing less than perfect. So this lack of open communication to the world about the perfectness of her life is, in itself, anomalous. What’s more anomalous is the side of reality she shows me. The last two times I have seen her she has seemed depressed and preoccupied. It has seemed to me like she has a lot on her mind, and that the supposed perfect life really isn’t working out anymore. I somehow don’t doubt that to be true at this point. I even have the sense that she may be considering coming home, given some of the comments and little feelers she has put out over the last couple times I’ve seen her. One thing I’m sure she notices is that, regardless of how “perfect” she has claimed her life to be right now, I certainly appear to be far more happy than she. Look, folks, we are about 11 months into this affair now, and these things don’t have tremendous staying power. Eleven months is a pretty good haul for a totally immoral relationship. It’s certainly long enough for the infatuation to have worn off, and with it wearing off, so goes the affair fog. I have no personal experience in dealing with affairs — this is the first I’ve seen up close and personal — but I suspect that this is how they end. It appears to me that there has been a flurry of activity, starting around mid-July, that has been geared toward plugging holes in a sinking ship. It’s as if the fog began to burn off sometime around then, and with this burn-off came a concomitant attempt to keep that fog in place. Now, as things (hopefully) seem to be petering out, those attempts become both more vain and more sporadic. In fact, the last post I saw was almost a cry from the darkness. I almost have the feeling that there may not be any more such posts before I find out the affair has ended once and for all. I’ve got nothing to go on beyond intuition here, but I think that something is brewing up there at Camp C-S and it is not good. I think there have been enough disagreements and fights by this time that the wheels have finally started to come off. I even think it possible that there could have been game-ending arguments, and that she possibly could have been asked to leave Camp C-S once and for all. I don’t know, I just don’t know. One thing I do know is, I’m ready. I had a very interesting dream this morning. It was one of those enigmatic dreams that has you waking up wondering what its message truly was. You see, last night I went to sleep asking myself to have my subconscious send me a message about my marital situation, and was pretty certain that it would do just that as I was fast asleep. It did, but before I can explain that, I’ll need to recount the events of yesterday. This past week has been a sort of recap in miniature of the events of the previous month. Over the first few days after I saw my wife last week, she at least left her cell phone turned on, and I’m reasonably sure that she was checking her voice mails. Her new blog lay silent and her posts to the adulterer’s professional Facebook account had stopped. Then, this weekend, things went blank. She turned her cell phone back off. On Tuesday morning, I had a peek at her blog, and she’d written two new posts. This was followed by a couple of pictures posted to the Facebook account. Only the latter were current; the former were recounting events from a couple of weeks ago. This struck me as rather odd: why didn’t she just post these events after they had occurred? I mean, it’s not like she is really busy, or anything like that. Yesterday morning she texted me just after 9:00 a.m. She was back in town and was asking me if I could come pick the dog up at her colleague’s house. I called her right back and she answered. I told her I’d be happy to pick up the dog, and I’d need about 20 minutes to get ready. I packed a couple of quick gifts, and set off to meet her at a cafe nearby her colleagues house. After a few minutes of chatting, she asked me if I had time to take her to the bookstore. Her brother’s birthday had passed a couple of weeks ago, and she had not bought him anything. I told her I was happy to do so; I thought she had wanted to go to a nearby bookstore, but she actually wanted to go to another one — one of our favorites — across town. I agreed, and off we went. We picked up the dog at her colleague’s place (the bookstore is dog-friendly) and had a nice time browsing the bookshelves. She got him a nice gift and had it wrapped. Then she asked me if one of our favorite restaurants downtown might be open. This was a pretty sly way of her asking me if I’d have lunch with her. The restaurant is quite popular, and is only open 4 days a week — it’s run by the retired father of a very famous chef, and it’s basically just something he does for fun, rather than profit, even though the business clearly is very profitable. We agreed to drive by and to eat there if the line weren’t too long; often the line to get in will snake around the corner. Well, there was a line, not a long one, but a line nonetheless. So we opted to go have pho (Vietnamese noodle soup) instead. Since the dog was with us, parking was an issue, so we ended up at a fairly upscale Vietnamese restaurant, and had pretty much a legitimate “date” — this is a place we had been on an actual “date night” while we were married, and so that context was there this time as well. The food was great, and we had a good time. But, I had to get to work and time was getting short; she offered to take the bus back to her colleagues place, and I pretty much had to agree to drop her off at a nearby bus stop. She didn’t seem to mind very much, and I made it to work with about 2 minutes to spare. After working a full day, I had a bit of time to decompress and to try to figure out what the significance of this meeting was. I do think she is finally exiting the fog, yet at the same time I think she finds both the choices in front of her and the consequences of her actions quite daunting, and rightly so. I am trying to cushion her landing as much as possible, but I do think it will be a pretty hard landing when it happens. In fact, my deeply intuitive sense about all of this right now is that she is poised for a major meltdown, and that meltdown is coming very soon. It only needs a trigger, and the least little thing can trigger it without much difficulty. I know my wife better than anyone, and believe me, I know when she’s gotten to that fragile point at which a meltdown is imminent. So, last night I set myself the internal question of “what is this all about?” and then went to sleep. I had two dreams. The first one took place at Lake Tahoe. Now, I haven’t been there in over 20 years, but the context was one of inviting people to show up, and they would then arrive. This was a bit ambiguous, but I think this meant that I now need only to invite my wife to show back up in my life, and she will. I was rather uncertain of this message, though, and so I went right back to sleep with that same question. The next dream also took place in Lake Tahoe, but this time in the context of me driving through there on my journey home, which was at a totally different location. (I’d have to drive north to get home, yet I was driving south.) I stopped in Lake Tahoe for gas, and the attendant agreed to fill the tank for me, ostensibly at no additional charge. I walked around a bit, and noticed a couple sitting at a table behind their parked car, with their dog sleeping on the ground next to them. Just next to that table was a little fence that demarcated the California-Nevada border. The gas pumps were in California, and the cashier was in Nevada. I walked back over to pay the bill, and one of the attendants quoted me a price that was clearly too high. She then said I had been charged a $39 service fee on top of the gas price. I was livid, because this fee had not been explained or laid out anywhere. I took the receipt and scribbled out that fee and told her I would not pay it. She told me I’d have to, so I took the receipt into the cashier’s office and raised a big stink. The young lady was standing behind me, and I told her she could just go away. I knew internally that getting angry and making a big stink would not help my case at all, and that if I wanted to have that charge removed I’d have to be calm and personable, but still I was making a big stink. I told the lady behind the counter that I would not pay this additional fee, period. She looked at me and smiled, and said, “it’s the second sleep.” I was very confused. I then said, “what on earth is that supposed to mean?” Again, she smiled — this time revealing some rather bizarre looking teeth, one of which was studded with a small gemstone, and a strangely receding gum line. And once again, she said, “it’s the second sleep.” Then the dream dissolved and I woke up. Now awake, I asked myself, “what does that mean, ‘it’s the second sleep’?” And the answer was a bit convoluted, but also somewhat revelatory. It means that I was aware, even in this dream, that it was my second dream in a row on that topic, and that I was looking for an answer and not finding it. I wasn’t going to find it, because the answer was the dream itself. Translating this to my wife’s situation, it means that she has been in her “second sleep”; the first “sleep” was the wall of silence that occurred over the previous month. This “second sleep” was the miniature version of that wall of silence that occurred during the last week. Just as this “second sleep” came to an end in my dream with the awareness that it was just nothing other than sleep, my wife’s “second sleep” is similarly coming to an end with her own process of awakening. There is likely more to it than that. Enigmas do not give up all their secrets at once. However, the process of awakening is irreversible, and I eagerly look forward to welcoming my wife back into the waking world.